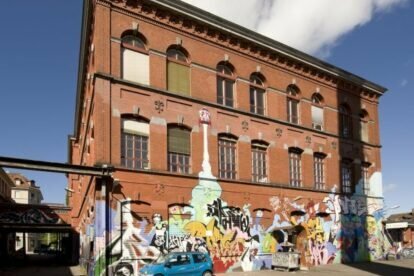 The Rote Fabrik is one of the bigger cultural centres in Zurich and recently celebrated its 30th anniversary. As the name implies, the building-complex once was a factory. Music is a big thing here: there are over 100 concerts, parties and festivals every year. Now, if you know me (respectively my texts on this site) you’ll expect that there’s mainly rock music. Wrong. Hip-Hop, Reggae, Soul, R’n’B, Worldbeat, Folk and Jazz are equally as important. The people in charge characterize their program as “music from aficionados for aficionados”, speak: stuff that’s good but not necessarily mainstream. But there’s not only the music, there’s a theatre, there are a lot of readings, sometimes panel discussions, a bar to have a drink and a restaurant where you can eat really well. Oh, I almost forgot: The Rote Fabrik is located right at the lake… which is gorgeous, especially now the warm days are inviting for outdoor fun.